Deep in the heart of East Texas is a tradition like no other. Good food, great company, and a little friendly competition is what people get to experience at the Hopkins County Stew Contest. While the official contest began in 1969, this tradition dates back to as early as the 1800’s. Back when the competition was first documented in 1969, the county had around 100 schools, all of which would participate in the end of year stew celebration. An iron pot, an open fire, and whatever food you could find in your house were the foundational components of this stew. The meat, more than likely squirrel at the time, was added to a pot filled with various vegetables. 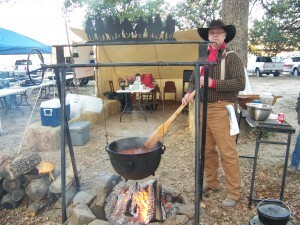 Because there was never an official recipe documented, the Stew Contest just encourages participants to include the five ingredients always known to be in a good, hearty bowl of Hopkins County Stew: chicken or beef (they have opted out of using squirrel these days), corn, potatoes, onions, and tomatoes. Prizes are awarded in two categories, chicken and beef. A school in Dallas, Texas decided to bring the stew to their school as the Hopkins County Stew Fundraiser. Lake Highlands Elementary School sold tickets for homemade Hopkins County Stew to help raise money for their school. Two Funny Girls made personalized stadium cups as well as personalized napkins for the event, and it was a huge success. The Hopkins County zip code is 75482, while Lake Highlands Elementary School’s is 75238, hence the cup design. Heat 4 cups water to boiling in a 5-quart saucepan on top of stove. Add chicken or cubed beef and 1 1/2 teaspoons salt. Reduce to medium heat and simmer until meat is tender, reserving liquid. If using chicken in your recipe, remove pieces from pan and allow cooling before boning and dicing meat. To reserved liquid, add potatoes and onions. If necessary, add just enough water to cover the ingredients and simmer on medium heat until potatoes are tender. Add diced chicken or beef, black pepper, tomato sauce, diced tomatoes, remaining 1 teaspoon salt, chili powder, and paprika and bring to a boil. Add cans of whole kernel and cream-style corn while stirring stew on high heat to prevent scorching. Reduce heat to a simmer. If necessary, add water to bring stew to desired consistency. Cover and simmer over medium heat for 15 minutes, stirring as needed. Other ingredients may be added to suit individual taste. Serve with saltine crackers or cornbread, cheddar cheese, and dill pickles. Two Funny Girls Hosts: a Customizable Cinco de Mayo! Customize Your Kentucky Derby Party! Taco ‘Bout a Graduation Party!